There is still room at our camping sites and school accommodation. You can change your ticket for a wristband on Friday, Saturday and Sunday at ticket change points next to ice rink (see map). After the festival on Monday at 12 noon, all items considered valuable are delivered to the North Carelian lost and found office, which answers to your queriest at number +358 600 550 127 (1,99 €/min + lnc). Office is open on Monday 15 July from 11am to 5pm. You can ask about Ilosaarirock Festival or give us feedback by calling our info phone at +358 50 575 3975 from Mon to Fri between 9 am and 4 pm. Thanks to all you lovely people! Ilosaarirock Festival 2013 is over. In every way we had the greatest festival so far. First of all we want to thank all of you, our dear festival guests. The Ilosaarirock Festival broke previous records: on Saturday we had 24 000 daily visitors, on Sunday 23 000 visitors. Töminä and Sulo clubs had 7 000 visitors on Friday. Thank you for arriving at Laulurinne in such great numbers, and see you again at the next summer's festival between 11 and 13 July 2014. 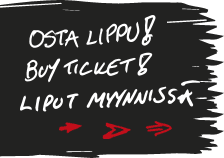 Advance sale of 2014 two day tickets for Ilosaarirock is already on. You can order you tickets via Tiketti. See you next year!